Saturday, June 8, 2019 from 10 a.m. to 4 p.m. Experience the Town of Erin by visiting some of our fascinating and charming treasures during Doors Open Erin. Erin is a beautiful place to visit and find your roots in small-town charm and rural simplicity. Heritage buildings, winding country roads and fertile farmers’ fields abound. Erin has a strong heritage in agriculture; our roots date back to the early 1800s. Whether it is in a local eatery, pick-your-own farm or the local Farmers’ Market, Erin is central to being delicious and local. Want to get outside? Erin boasts a huge network of trails and local parks – great for outdoor hiking, winter sports, cycling, horse-riding and exploring. The Town of Erin offers a beautiful, rural setting – no matter what time of year you visit. Enjoy our festive events, explore winter’s natural allure and pick up unique treasures for everyone on your gift list. The villages and hamlets of Erin are home to family-owned and -operated businesses that offer a great selection of beautiful home décor, gift items, fashion, art and delicious local food. 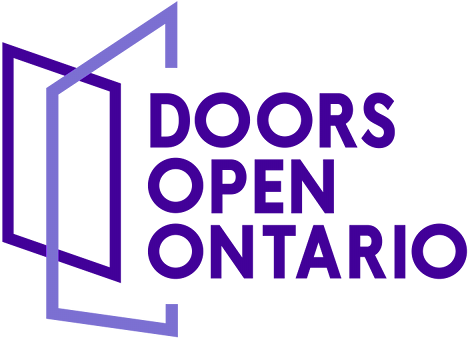 Doors Open Erin is a rewarding and enjoyable volunteer opportunity that helps keep our town’s heritage alive. If you would like to volunteer for this event, please contact Robyn Mulder at 519-855-4407, ext. 241. Canada’s fastest-growing show jumping tournament venue, Angelstone hosts four weeks of equestrian show jumping in June and August. During Doors Open, visitors can stroll the grounds and take in the action with over 500 of North America’s top horses competing in four rings throughout the property. At 6 p.m., Angelstone will present the Headwaters Cup, featuring Olympians and their jumpers. Built in 1906, this former church features original elm panelling, curved pews, stained-glass windows, horse-tethering rings and many features that were modern for its time. The building, now the vibrant home of Century Church Theatre, also boasts one of Ontario’s largest bat colonies! In June, the theatre will be celebrating the 20th anniversary of the Erin Arts Foundation. This stately guest house sits on part of the original 81 hectares (200 acres) of Crown land that Abraham Nelles claimed in 1820 and sold to Daniel McMillan in 1836. In 1846, Daniel sold half of the land to Charles McMillan, who built the house. Now a bed and breakfast, the house has original stained glass, wood trim and hardware. Hillsburgh House is a charming century farmhouse in the beautiful town of Hillsburgh, featuring two guest rooms, lovely gardens and a peaceful view of Mill Pond. Popular guest activities include making s'mores by campfire, relaxing in the outdoor hot tub or enjoying refreshments on one of three patios. Come and join us for lemonade, iced tea and a special treat! Opened in June 2018, this new library sits on the shores of a mill pond that was once part of the Gooderham and Worts distillery empire. This branch is a stunning addition to the county library system. VG Architects successfully incorporated an 1892 rural home into a modern glass-and-brick addition that features expansive views of the pond. The LongRun Thoroughbred Retirement Society is a registered charity that provides Ontario’s thoroughbred racehorses with a happy and dignified retirement when their careers at the track are over, and to educate Ontario’s horse industry and the public about the merits of this program. They currently care for over 50 retirees at their Hillsburgh farm while they await loving new homes. The Porcupine's Quill is an artisanal publisher that values the art and craft of the book, both in content and in form. Their mandate is to preserve the culture of the printed word by using their expertise in the art of 20th-century offset printing technology to create quality books that look and feel like 19th-century letterpress products. Tailwinds Bed & Breakfast strives to embody the town's mantra: "Where urban style meets country charm." Tailwinds is operated from a custom-built home nestled on vibrant wetlands. The Elora Cataract Trailway is just steps from the front door. After an adventure on the trail, rest in the sunroom or take a relaxing soak in the upstairs bathroom. Woodlands Farm raises thoroughbred racehorses. This land – part of the McKinnon ancestral farm – has raised multiple Queen's Quineas winners and a Queen's Plate champion. Residing at the farm are this year's foals and their mothers, young racehorses in training, as well as older horses. The owners look forward to introducing you to these beautiful animals who love company. Bring carrots!